This may be just the thing you’re looking for! Do you wish it was easier to provide proactive care? Do you get frustrated by the lack of features in your clinical software? “Yes”, said Anton Knieriemen (Vic Collabs, current wave) to these questions. And then he decided to fix the flaming thing. He wrote a computer program that links with Medical Director (or Best Practice) and lets you know which of the RACGP Preventative Activities are due for the patient you are seeing, according to that patient’s specific age and history. I am passionate about preventive care and change principles. I leverage the software that I create to implement change in the way I practice medicine. A feedback loop for improvement has emerged. With better information access and workflow improvements new opportunities for innovation have arisen. After Learning Workshop One, Anton was concerned that practices were having to create spreadsheets of their diabetic patients manually. 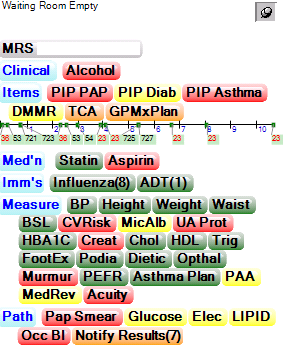 He added the capability for DCP to create and export a spreadsheet of your diabetes patients, containing appropriate clinical information, colour-coded. Doctors Control Panel is available as a free download. Anton suggests that if you find it useful you may like to donate to the charity of your choice. Anton recently presented at APCC LW3 in Sydney – and it is the only breakout I have been to that has received a standing ovation! You can see his slides and hear his talk at this site order Fluconazole buy doxycycline . You can also view a video demo of Doctors Clinical Desktop. I’d value your comments and feedback. Hi Tony. I have placed a link to your article on the DCP Homepage. I am looking forward to catching upo with you at the conference. We have found your Doctor’s Control Panel to be very useful and a great advantage. Could you please let us know the difference between the yellow tag and the orange tag. There are several warnings (Not related to guidelines ) at top or bottom of panel which are Orange. Also Some MBS items may be orange if the item is not due to be repeated but ‘can be repeated if circumstances have changed’ as per MBS guidelines. I am really pushing the use of the Doctor’s Control Panel down here (Riverina) & really appreciate your endorsement via your emails etc….it’s so brilliant – not hard to push really! Knowing that you are a Genie user….I wondered if there is anything quite like it for Genie practices – I’ve got 3 practices using Genie. We’ve rolled out the CAT tool down here to 19 practices with quite good success – the hard part now from my perspective is managing all the data & feeding back – hopefully that may all improve soon with further enhancements. Although the PEN CAT tool (http://www.pencs.com.au/prod_detail.asp?cat_id=10&prod_id=20) works on Genie, the DCP does not. However, Genie has some internal functions that are similar to the DCP, such as the ‘EPC Summary’ button.